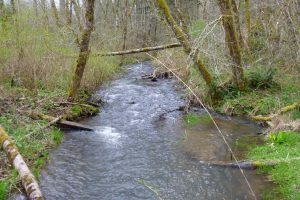 Milton Creek LWD Project is a partnership between the SB Watershed Council and the City of St. Helens. 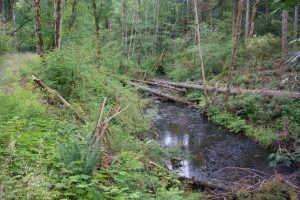 The goal was to install large wood into the mainstem of upper Milton Creek, slowing the creek and restoring natural processes by creating pools and restoring side-channels. The Council worked with two local contractors and the City to fall over 300 pieces of large wood into the stream along 3 miles. The wood pieces were placed in a cross-stacked form that works to pin the logs in place and prevent downstream movement. 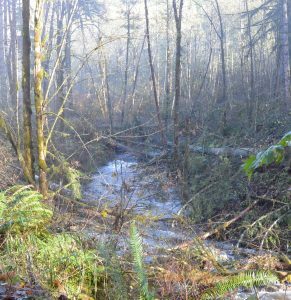 Smaller wood is added to the stacks and additional debris will build over time, creating areas that will trap and sort gravel, adding additional fish habitat.